Lately, my time has been consumed by two things: figuring out my embroidery machine…. and taking care of four foster kittens. 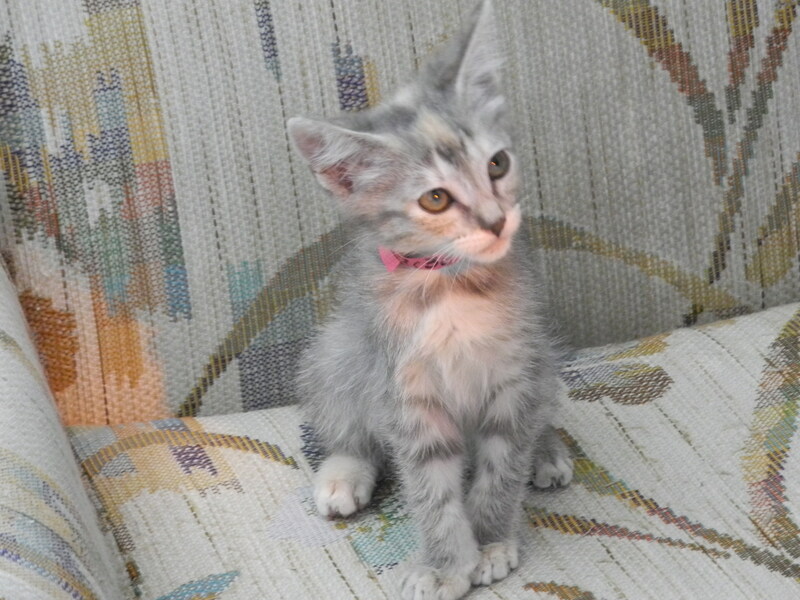 We’ve had them for 2 weeks – actually today they went for a weigh-in at the humane society’s foster center. The way it works is, we take care of them until they weigh enough to be spay/neutered, and then they’ll be put up for adoption. 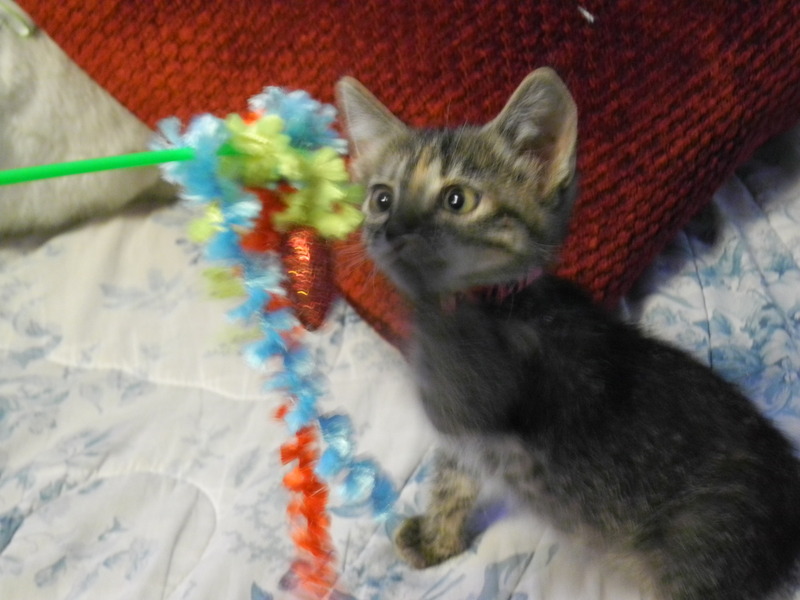 One of the kittens, Brook, playing on my bed. Brenna on the loveseat. She’s the most independent and adventurous one. 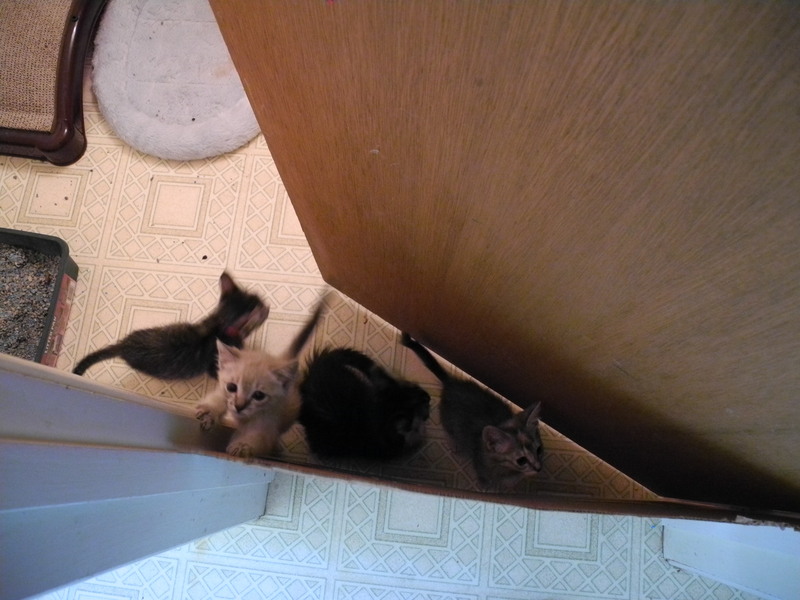 She never wants to go back into the “Kitten Room” (our downstairs bathroom). Apparently, back when my parents moved into this house, the downstairs bathroom was carpeted (WTF? ), so the door has a gap under it…. which kittens can fit through. Thus, we use a piece of cardboard to help close the gap (only effective when the door is closed, of course). Our adult cat, Zsa Zsa, is none too pleased with the kittens being here. So we have to try to keep them separate. A few days ago Zsa Zsa got really sick… she’s had a fever and wasn’t eating. My parents took her to the vet and he gave her a shot of antibiotics and a vit D shot (“to peak her appetite)… but it wasn’t until today she started eating again. We don’t think it was the kittens that made her sick …. since they haven’t really been in contact…. actually my mom says she thinks maybe Zsa Zsa ate a roach or something like that. I’ve been thinking I should collect some videos… and then make a little collage… We’ll see if I get round to it!